We’d love your help. Let us know what’s wrong with this preview of Emily and Carlo by Marty Rhodes Figley. To ask other readers questions about Emily and Carlo, please sign up. Una vera chicca per tutte le ammiratrici e gli ammiratori della poetessa americana Emily Dickinson. Questo bel libro, in lingua inglese, si intitola Emily and Carlo, è stato scritto da Marty Rhodes Figley ed è stato illustrato da Catherine Stock. E’ stato pubblicato dalla casa editrice Charlesbridge nel 2012. Racconta l’indimenticabile e straordinaria amicizia tra Emily e il suo cane, il Terranova nero Carlo. Com’è scritto anche nel libro, si pensa spesso ad Emily Dickinson come a una solitaria ra Una vera chicca per tutte le ammiratrici e gli ammiratori della poetessa americana Emily Dickinson. Com’è scritto anche nel libro, si pensa spesso ad Emily Dickinson come a una solitaria ragazza reclusa nella sua casa, ma Emily non era affatto da sola. C’era Carlo con lei. Tutta la loro storia, accompagnata da delicate e luminose illustrazioni, viene ripercorsa fin dall’inizio, dall’arrivo del cucciolo Carlo alla Homestead fino alla sua morte, con numerosi riferimenti alle lettere e alle poesie di Emily, nel quale raccontava del suo fedele amico. Carlo fu un regalo del padre per farla sentire meno sola. E così fu. Era l’inverno del 1849 ed Emily aveva diciannove anni. Venne scelto un nome italiano in onore del libro preferito di Emily, Jane Eyre di Charlotte Brontë. Carlo divenne fin da subito il suo migliore amico, il suo alleato, la sua guida. Era un cane buonissimo, intelligente, saggio e silenzioso. I suoi occhi esprimevano molto più delle semplici parole. Sempre insieme, ogni giorno, durante le loro passeggiate, Emily e Carlo esplorarono i boschi e le colline di Amherst, ammirando la natura, i fiori, gli animali, tutto il mondo che li circondava. Le illustrazioni, sognanti e fiabesche, fanno immergere completamente il lettore nella storia, è come se Emily e Carlo fossero davanti a noi. Con il tempo, Carlo invecchiò e purtroppo morì nell’inverno del 1866. Aveva diciassette anni. Emily soffrì tantissimo per la sua perdita, tant’è che non prese più nessun altro cane e si rinchiuse di più in se stessa. ll suo “muto alleato” se n’era andato da questo mondo, ma continuava a vivere nelle sue poesie immortali che sono giunte fino a noi e sempre vi rimarrà. Apparently Emily Dickinson owned a Newfoundland dog. I did not know that, and found it an interesting new fact to learn about this poet. 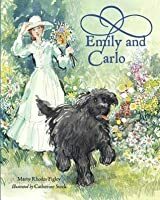 This picture book, illustrated in beautiful watercolor paintings, relates how Emily was given Carlo as a gift and how he was her beloved (and often only) companion for for sixteen years. The text sprinkles quotes from her poems and letters throughout, and ends with a brief author's note and a source list. Nice look at how dogs can inspire and comfort. Heartwarming. Beautifully written and illustrated, this is a story about the deep inspiration and companionship Emily Dickinson received from her cherished dog, Carlo. I have to admit I've never been a big fan of Emily Dickinson--I've always found her poetry challenging and thought of her as the reclusive, dour-looking New England spinster that we've all seen in photographs. What a different Emily we encounter in the wonderful new picture book, Emily and Carlo, by Marty Rhodes Figley. When Emily's siblings both left the Dickinson home, we learn that her father brought her home a big, black, slobbery puppy (probably a Newfoundland) to entertain her and keep her I have to admit I've never been a big fan of Emily Dickinson--I've always found her poetry challenging and thought of her as the reclusive, dour-looking New England spinster that we've all seen in photographs. "Emily missed her best friend. Carlo was her only dog for sixteen years. She never had another." There are not that many picture books for children that are based on scholarly papers published in academic journals. Emily and Carlo is one, however; Figley is not only a member of the Emily Dickinson International Society, but also the author of an academic paper on Emily and Carlo that was published in The Emily Dickinson Journal. Back matter includes an Author's Note, additional biographical information on Dickinson, sources of quotations, and a brief bibliography. After reading Emily and Carlo, I am eager to rediscover Emily Dickinson's poetry, and I'm sure many sensitive young readers would feel the same. The book provides a fresh perspective on this celebrated author, one that makes her accessible to children and adults alike. This would be a terrific book to use in conjunction with a lesson on Emily Dickinson and her poetry, or just to read and enjoy for its luminous watercolor artwork by Catherine Stock and its quietly moving text about the powerful love between a dog and its owner. Carlo - one of the earliest documented therapy dogs. The companion to Emily Dickinson. Text and watercolors combine perfectly in this affectionate and deeply moving portrait of Emily Dickinson and her time with her companion, Carlo. The vibrant watercolors evoke Carlo - one of the earliest documented therapy dogs. The companion to Emily Dickinson. Text and watercolors combine perfectly in this affectionate and deeply moving portrait of Emily Dickinson and her time with her companion, Carlo. The vibrant watercolors evoke joy and contentment, yet are delicate enough to suggest Emily's underlying fragility. Using contemporaneous source material, Figley shows how there were years in which Emily Dickinson was not a recluse - as long as she had Carlo at her side: visiting ponds, walking the woods, visiting her brother's house, taking tea. Quoting from Dickinson's writing, her deep affection for Carlo and the comfort her brings her is clear. It's evident that many of the poems we know about now were inspired by some of her jaunts with her large furry friend. When Emily Dickinson was 19 years old, she was lonely in the big home in New England since her siblings were off at school. So her father bought her a puppy that she named Carlo. The quiet and reclusive poet was an odd match with her bounding, huge Newfoundland. Carlo gave Emily more courage to be out and about, visiting others. He was with her always, a large drooling dog. They explored Amherst together with its woods, meadows and ponds. Their time together inspired her poetry, as shown in this When Emily Dickinson was 19 years old, she was lonely in the big home in New England since her siblings were off at school. So her father bought her a puppy that she named Carlo. The quiet and reclusive poet was an odd match with her bounding, huge Newfoundland. Carlo gave Emily more courage to be out and about, visiting others. He was with her always, a large drooling dog. They explored Amherst together with its woods, meadows and ponds. Their time together inspired her poetry, as shown in this book through stanzas that she wrote. This friendship with a dog makes this literary figure much more human and approachable for children. It’s a very special way to see an author. As an owner (& author) of Newfoundland dogs, I'm always on the lookout for a new book featuring this magnificent breed. Emily and Carlo is a gem! I greatly admire Emily Dickinson and learning about her relationship with her gentle Newfie, Carlo made me admire her all the more. Their special bond was strong and there's no doubt Carlo was her muse. The illustrations are perfect -- ethereal, charming and quiet. I was completely taken with this lovely book and purchased it for my personal librar As an owner (& author) of Newfoundland dogs, I'm always on the lookout for a new book featuring this magnificent breed. Emily and Carlo is a gem! I greatly admire Emily Dickinson and learning about her relationship with her gentle Newfie, Carlo made me admire her all the more. Their special bond was strong and there's no doubt Carlo was her muse. What a delightful glimpse into the life of Emily Dickinson that focuses on her relationship with her dog, Carlo, who was her companion for 16 years. It includes excerpts from her letters and poems, using her own words to bring the relationship alive. My younger children enjoyed it, but I think only adults or teenagers familiar with Dickinson's poetry could fully appreciate this brief portrait in words and pictures. An enchanting illustrated storybook that describes the unique bond Emily shared with her beloved canine, Carlo. More than a pet, Carlo was Emily’s ultimate companion, confidant, protector and guide. It was a delight to understand the extent to which Emily’s four legged friend enriched her life and ultimately shaped her writings. This charming picture book introduces us to another side of beloved American poet Emily Dickinson and her friendship with her dog, Carlo. Using pieces of Emily's letters and poems, the author crafts a realistic tale of life together infused with her imagination. A lovely read! Check out www.readerkidz.com for another review of this beautiful book. Poignant story of Emily Dickinson's life with her dog, Carlo which she had for sixteen years. Weaved onto the story are Excerpts of Emily's poems and letters. A nice example of creative nonfiction. In the back of the book- notes about Emily, author's note, sources of quotation, and bibliography. What a lovely presentation of a lovely poet--told through her relationship with her dog, using snippets of her poetry. The lyrical writing is enhanced by compelling watercolor artwork that I kept looking at over and over. A treasure! Gorgeous book with a fresh perspective on Emily Dickinson. Viewing this reclusive poet through her deep relationship with her Newfoundland dog, Carlo, makes Dickinson a person young readers can bond with, paving the way for future appreciation of her poetry. Based mostly on true to life facts about the beloved poet Emily Dickinson and her dog/best friend Carlo. If the story is even a little true than the works of Miss. Dickinson were greatly influenced by Carlo. Generations of fans can be grateful for this four legged companion in the poets life. A beautifully illustrated, touching story (incorporating quotations from her verse) about Emily Dickinson and her beloved companion dog. Includes author's note, source notes on quotations, and bibliography. A beautiful little book about Emily Dickinson and her "shaggy ally" of 16 years, a large, slobbery Newfoundland named Carlo. One of the greatest gifts I've ever received. Emily Dickson and her dog Carlos make this a kid friendly book about a famous poet with very sweet art. A delightful introduction to Emily Dickinson, which focuses on her friendship with her dog Carlo. Beautiful illustrations. Blah. Good premise, the art matched the style of the book, but it didn't stick with me.